Firstly, as is the case with all decent personal accounts, let's focus on the food. Mmm. I'll be the first to admit I'm not the most adventurous when it comes to food and so the champagne and seafood stand wasn't quite calling my name. The muffins, however? Delicious. This year's general café food was hands down the best it's been so far. Should you be visiting next year, if you're looking for minimal fuss and plenty of taste, track down the indoor café serving sandwiches and cake, or alternatively, tuck into fish and chips from the Bandstand area! Oh and don't worry, there's plenty of ice cream and Pimms to be enjoyed as well. 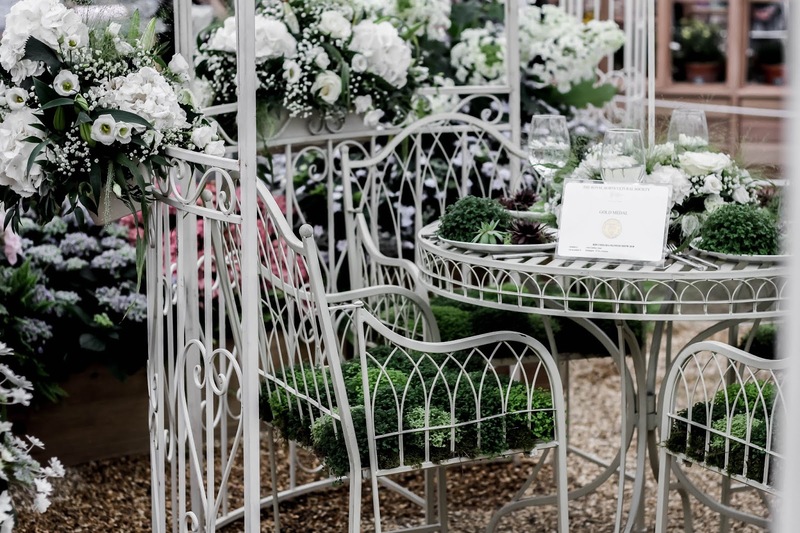 If you took a peek at my blog last weekend, you'll remember the outdoor garden party scene I created for Marks & Spencer. 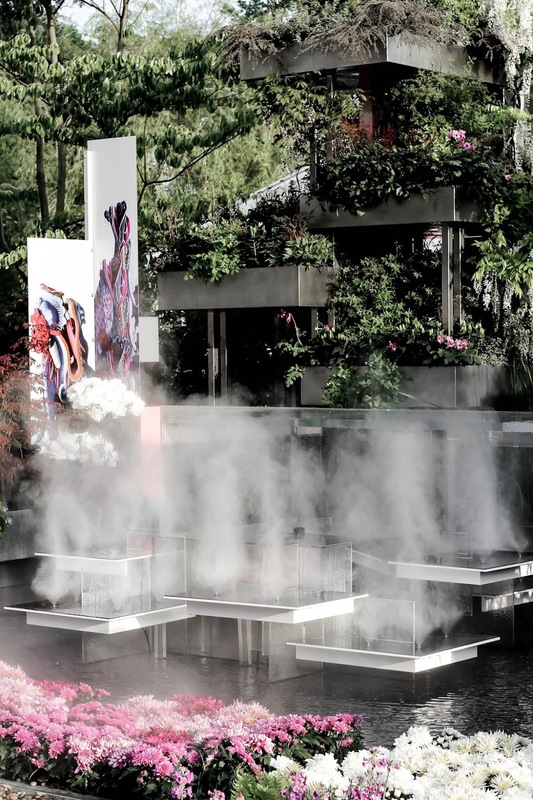 You'll also know I had been hugely looking forward to checking out their exhibit in the Grand Pavilion at this year's RHS Chelsea Flower Show! In short, it certainly didn't disappoint. 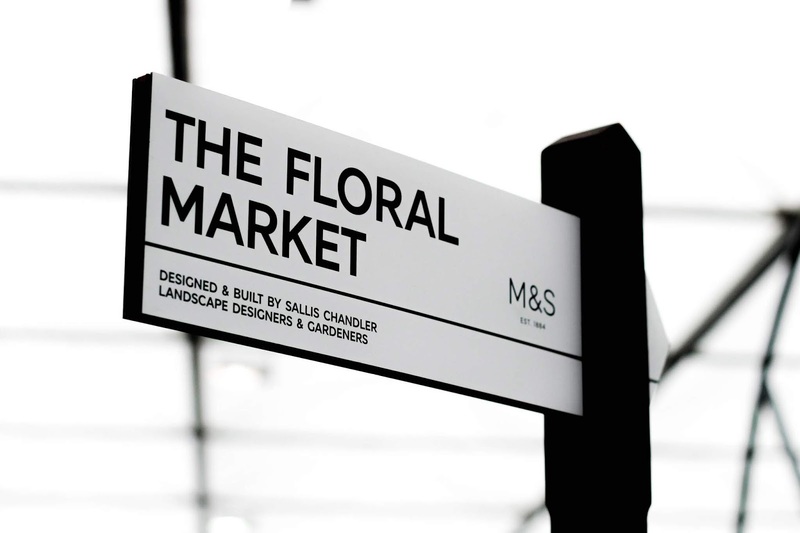 The exhibit emitted a definite sense of authenticity, having taken inspiration from British Flower Markets, and 'The Floral Market' signage was a very sweet touch. Anyone else find themselves forever drawn to marquees? The Grand Pavilion must have some sort of gravitational pull, because within 10 minutes of having entered the show, I always find myself wandering around the undercover exhibits. Pretty sure others feel the same too as it's always so busy there! 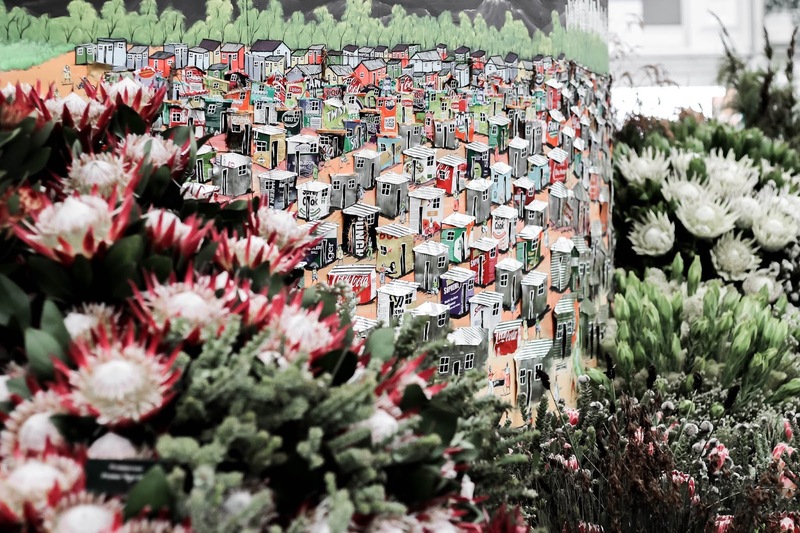 One of my favourite finds in The Grand Pavilion this year included the South African exhibit featuring a floral representation of Cape Town made from tin cans. 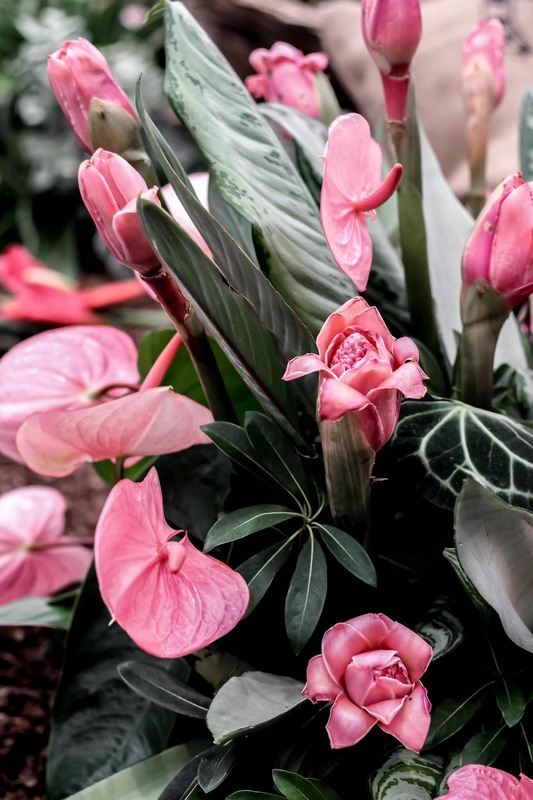 Incredibly, South Africa have now won 36 Gold Medals at the RHS Chelsea Flower Show - this year included! Another of my favourite features that appealed to my more romantic side, was the Fleur Boutique (Silver-gilt award winner). 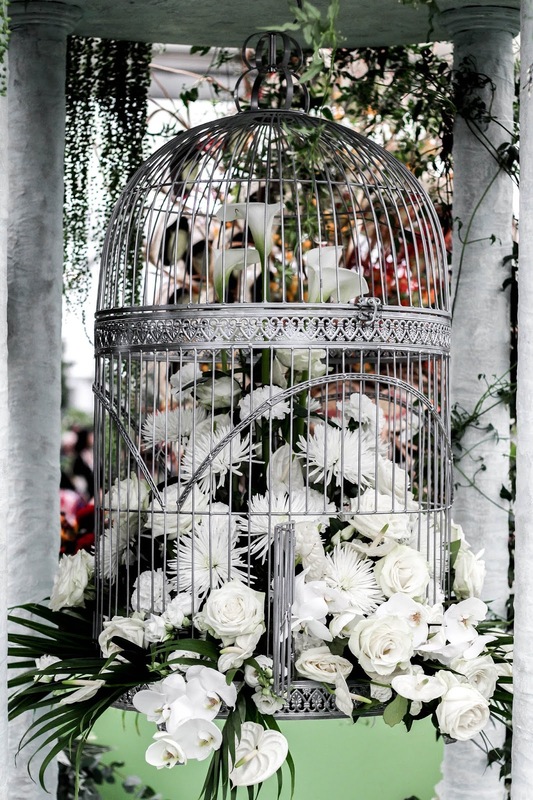 The white roses, orchids and chrysanthemums enveloped in a bird cage and surrounded by a grand 'stone' folly were spectacular and somehow managed to combine my wildest dreams of pre-Raphaelite paintings with A Midsummer's Night Dream vibes (albeit a cheerier, brighter vision), with a splash of wedding-planning thrown in for good measure. I don't know, but it was heavenly. 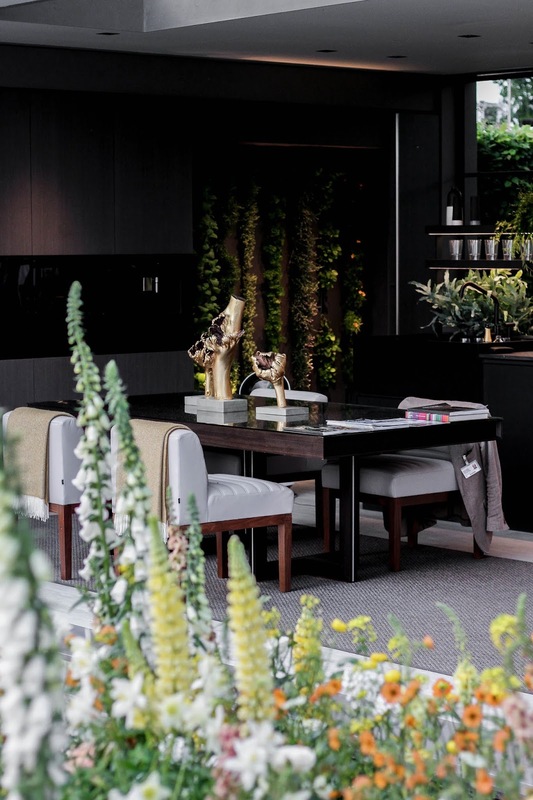 Ah, one of my favourite elements of the occasion has always been the Chelsea Flower Show's Young Florist of the Year competition. Incredible talent for such young florists! I really enjoyed the headdresses theme of 2016, however, wedding thrones? Of course that's going to become my new favourite! I've shared a couple of the most eye-catching thrones below, both of which were award-winners. No wonder such crowds were gathering around this exhibit! 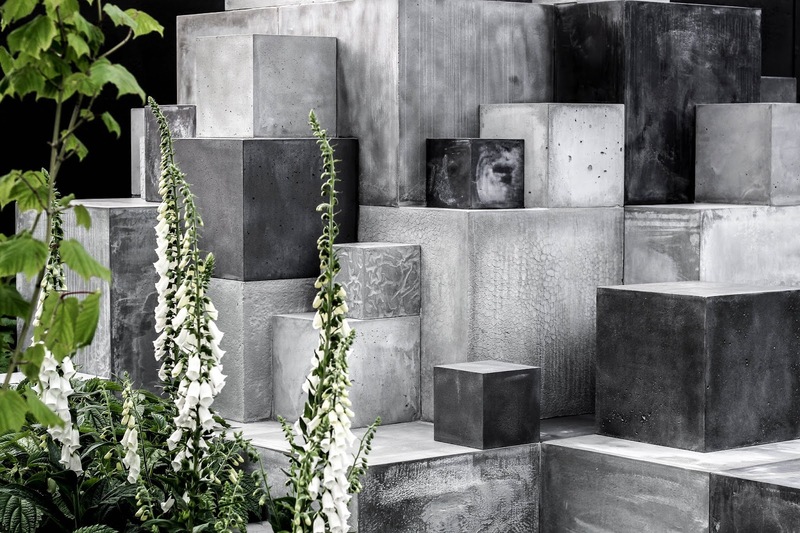 Modern sculptures contrasted beautifully with gentle flowers typically found in British gardens. The water feature was another eye-catching draw and one that definitely shot the popular exhibit up to the very top of my list. Love. Anyone else smitten with the striking turquoise and gold colour combination below? As much as I adore historic, italianate architecture, occasionally my heart screams for minimal design featuring clean lines and a clean aesthetic. Ask and Skin Deep will deliver! Created by the established UK skin company, the exhibit represents people with varying skin conditions that we all encounter. The garden hopes to show that although we may at times feel weakened by our appearances, collectively we are not alone and so can feel stronger. It's a beautiful concept and one showcased perfectly - it's definitely made a lasting impression on me! Keeping in theme with the show's focus of mindfulness this year, Laced With Hope helped to spread word of the charity Supershoes. 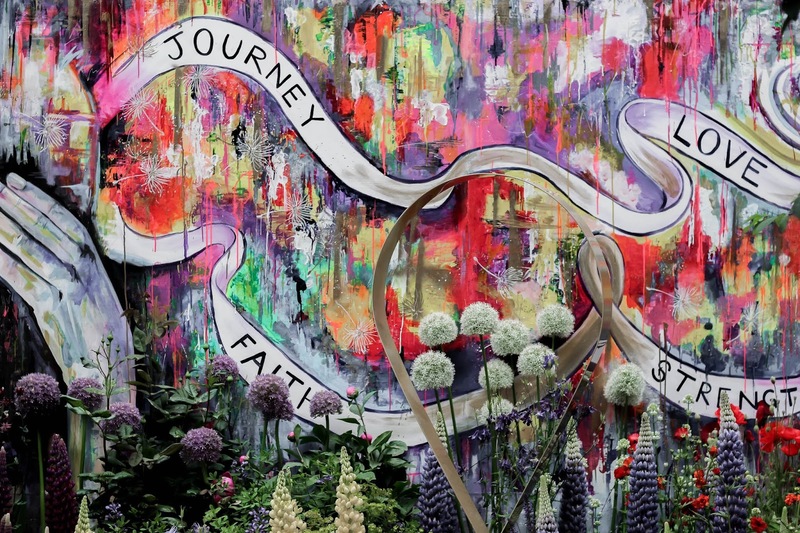 It's both a wonderful concept and display, bursting with colours and truly prompting curiosity into the charity's work. Through vibrant artwork, it shows the journey a child with a cancer diagnosis goes through. Tiny painted trainers lined the wall at the forefront of the exhibit that truth be told, made me feel a little choked. If you're looking for a charity to donate to, please do take a peek at their website and learn more about the fabulous work they do! 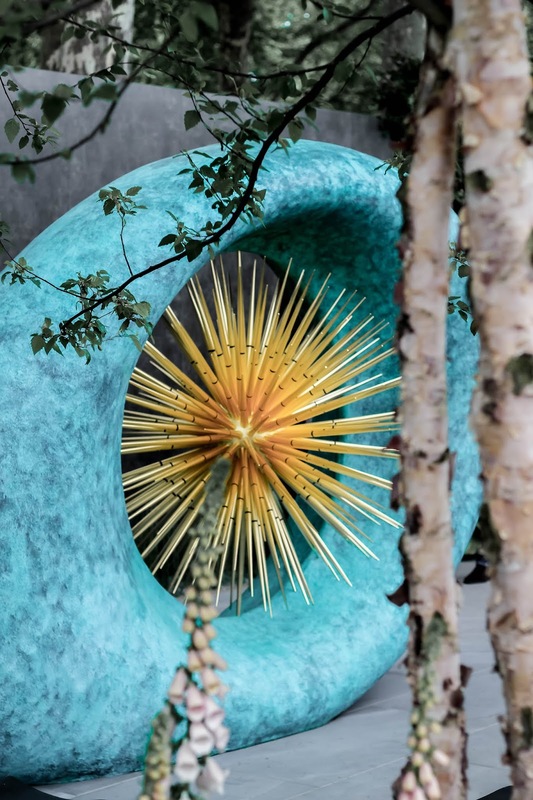 F I N A L T H O U G H T S . . .
As shown in both the first and last photos in this post, the Wuhan Water Garden is an indisputable crowdpleaser, and quite possibly my favourite feature of this year's Chelsea Flower Show! 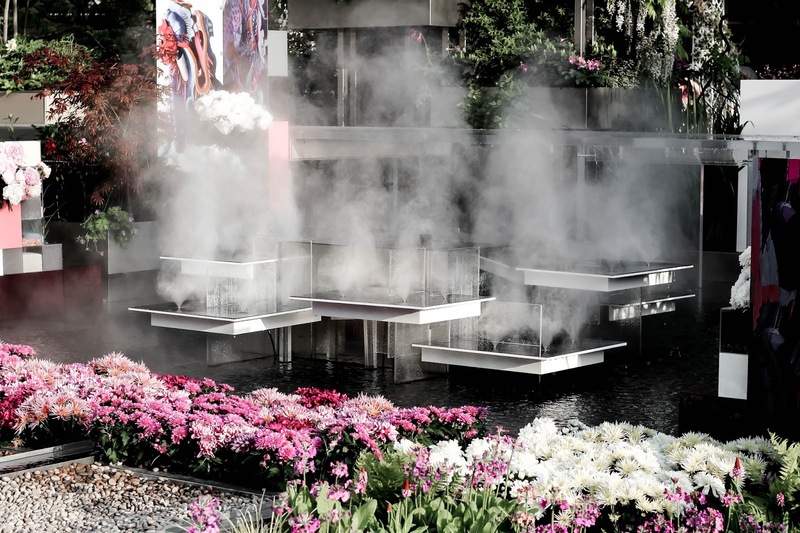 Featuring fountains, mist spray, water rills and an array of colourful plants (with pink being the feature colour), the Wuhan Water Garden was designed to be walked around and admired from all directions. 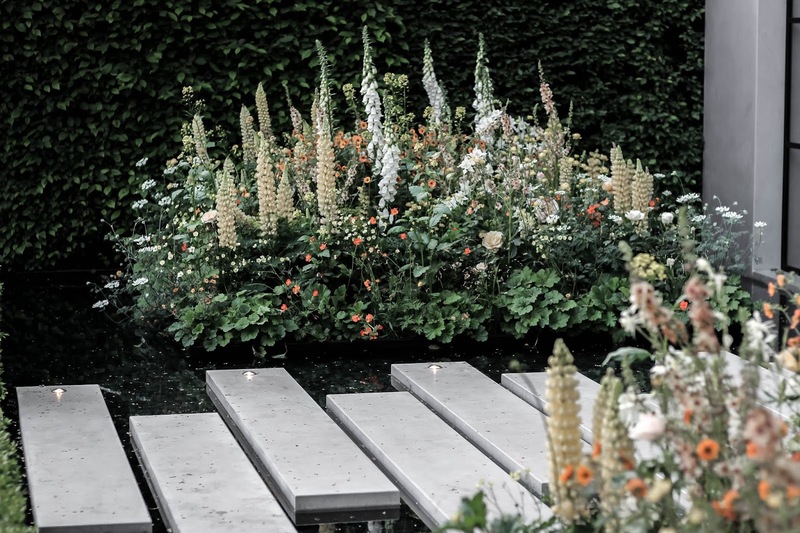 According to the RHS website, the garden was inspired by the historic ability of Wuhan - China's 'City of 100 Lakes' - to manage and control the flood waters of the Yangtze River. Phew! So, there we have it. 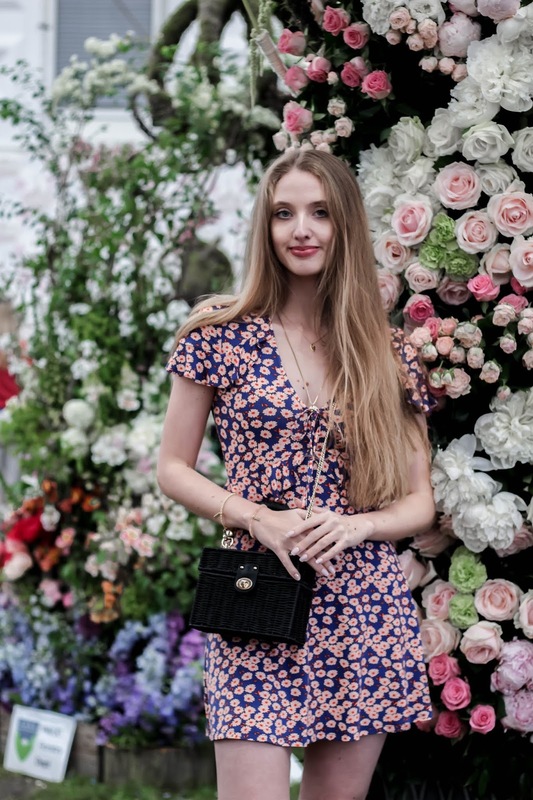 Once again, the RHS Chelsea Flower Show has been a total pleasure to attend and an annual tradition I plan to continue throughout the years. I'd love to know whether you've ever visited before? Does any particular exhibit from this post catch your eye? Let me know in the comments below! Looks like such an incredible flower show!!!! WOWOWOWOWO!!!! AMAZZZING!!! So ridiculously beautiful. My favorite is the skin deep exhibit because of the message behind it, but this is something that we could spend all day admiring. Honestly, it's such a necessary reminder of how gorgeous nature is! I wish CO had something like this! Oh gosh, this is unbelievably beautiful. My MIL loves flowers and has the greenest thumb and I know she would appreciate reading this post. All these flowers are so beautiful and your outfit is perfect. I really wish that we had something like this where I live! So beautiful place and so amazing flowers. Your photos are (as always) perfects!!!! Everything looks so lovely! I'd be so overwhelmed. That first throne though! I need it, in a permanent form. Hope you've had a nice weekend Gabrielle! Wedding thrones? I am considering remarrying just because of this! I love the floral dress you wore. It goes very well with the surroundings. You always look so pretty. The floral show looks amazing! The creativity of florists never cease to amaze me. I love flowers, well plants in general, and I love visiting flower shoes. I haven't been to any abroad, but in Split there used to be an annual floral show and I loved visiting it. A mother of my friend often exhibited there and I think she won some awards too. This Chelsea flower show just keep getting better every year. Thank you for sharing it with us. Wow, beautiful pictures and what a great thing to go to this time of year! The M&S flower market sounds and looks amazing!! Everything is just beautiful including you Gab. Oh my gosh, so many beautiful flowers and lovely arrangements! I wish I lived close enough to see the exhibit in person! This flower show is stunning. What wonderful pictures, you know I also love flowers and I usually share that in the blog. But this tradition is really very beautiful, but the most beautiful flower is you, my dear! So many beautiful flowers I would love it there!!! You look absolutely stunning with the flower background girl! What a fantastic place! So beautiful!!! Wow this place is so pretty! 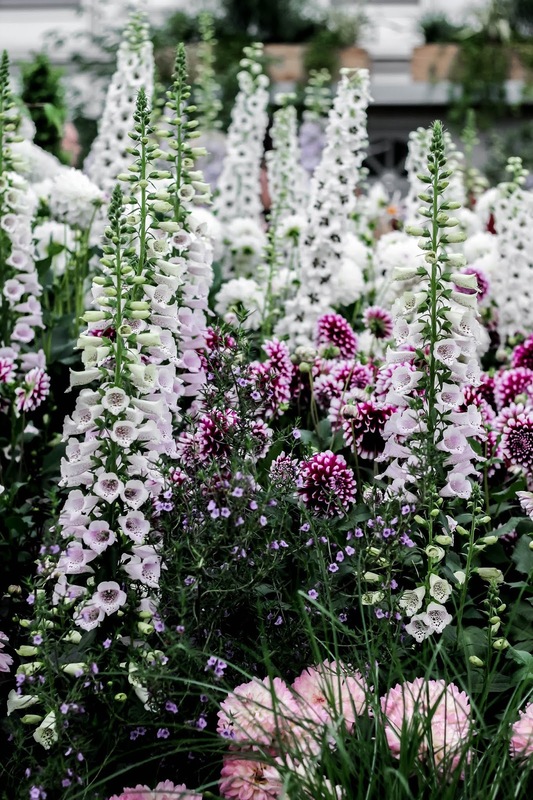 I feel like I've died and gone to flower heaven after looking at all these gorgeous blooms Gabrielle! 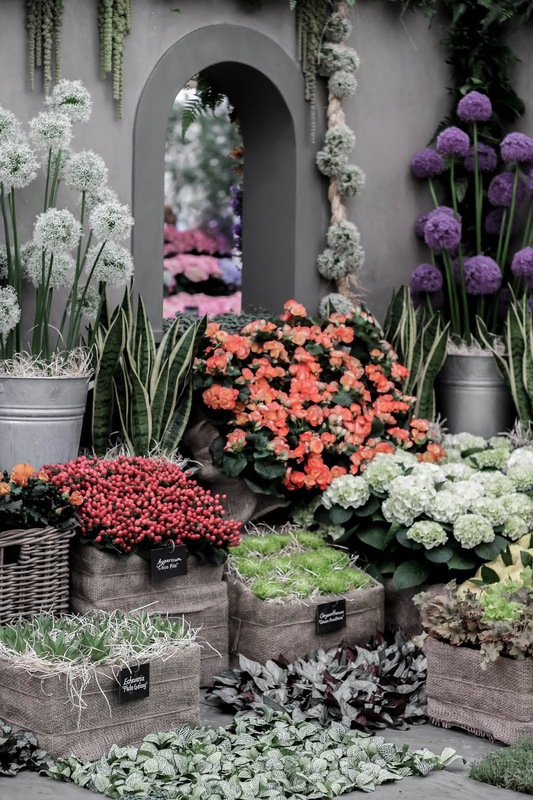 You can never go wrong with beautiful flowers and fabulous food so it's easy to see why the RHS Chelsea Flower Show is an annual tradition for you. All the exhibits are stunning but if I had to pick one which really caught my eye it would have to be the swoontastic Wedding Thrones. Wow! This place looks amazing!!! Gorgeous pictures. This flower show looks fantastic. Every year I promise myself to go but there is always something in the way! This year I’m enjoying myself in Cancun so not a bad substitute I guess But i do have to finally make this wonderful event. This is so amazing, loving the photos. 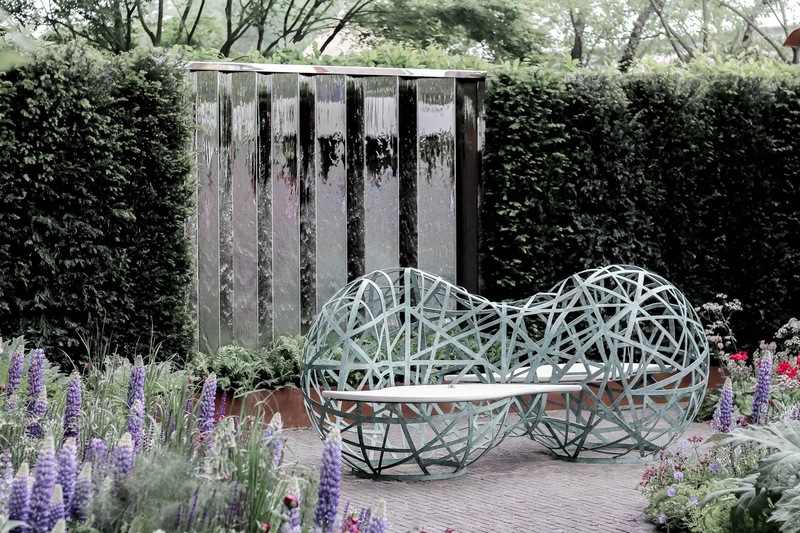 I have to visit the Chelsea show one day! 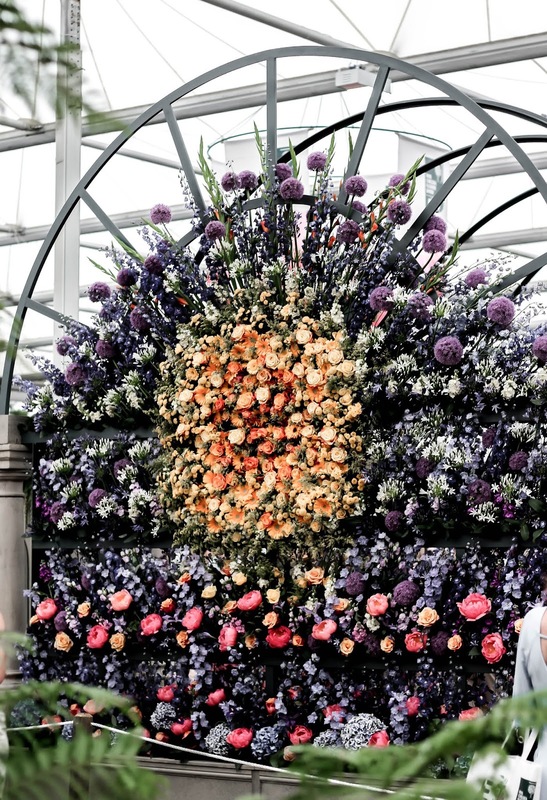 This flower show looks like a dream. It's so pretty ! I would of want to buy all of the flowers. It looks like such an amazing event even crowded. I love your flower dress. So pretty ! Beautiful photos! 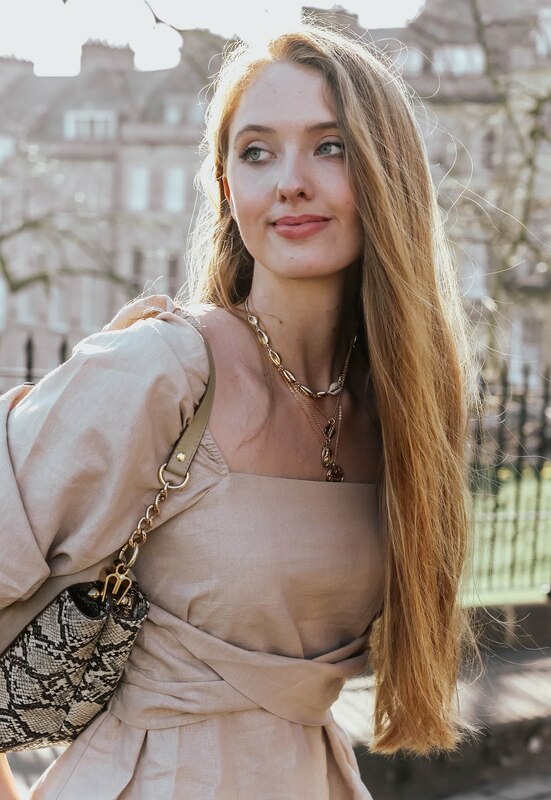 Of course you have the prefect dress for these pics. I would die to go here! This looks like the dreamiest exhibition!! So many incredibly beautiful flowers and I love how many different concepts were presented in flower show, amazing!! This is so cool! I would love to attend something like this. Everything is so beautiful and creatively presented. wow this flower show is absolutely stunning.. I watched a lot of the coverage on TV and thought it was stunning! Some of the big installations the designers made - wow! This flower market by M&S is super pretty! Did you get to smell any of the coconut orchids that German lady had? Thanks for your comment darling :) Sadly I'd not heard about that, there just never seems to be enough time there haha! Ah these photos are gorgeous Gabrielle! I've always wanted to visit the Chelsea Flower Show. It looks ah-mazing!! So pretty. What a gorgeous place. Amazing combination of design and blooms. The flowers are beautifully laid out. 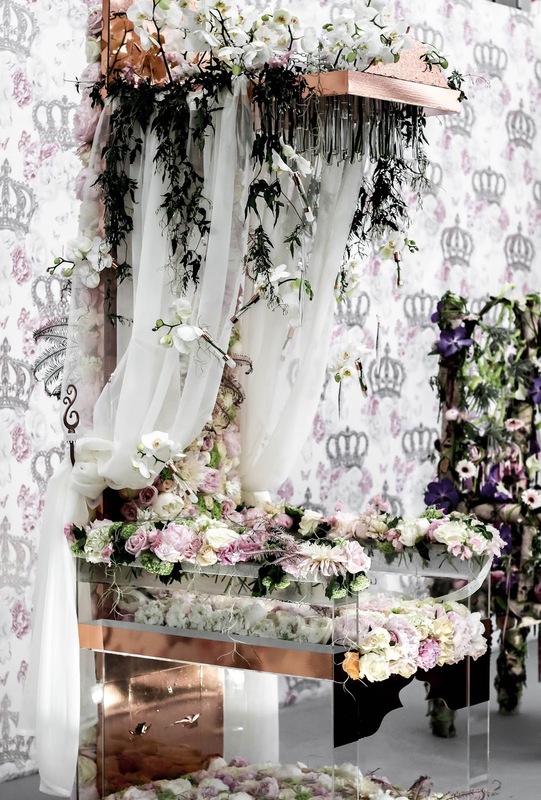 The floral compositions are stunning!! Oh wow, these pics are incredible, what a truly beautiful show !! Wow, all of the colours are just so beautiful! I've never been to a flower show before, I think the closest I've gotten is going to the botanical gardens in spring! OMG wonderful!!! *_* Everything is so perfect and beautiful! 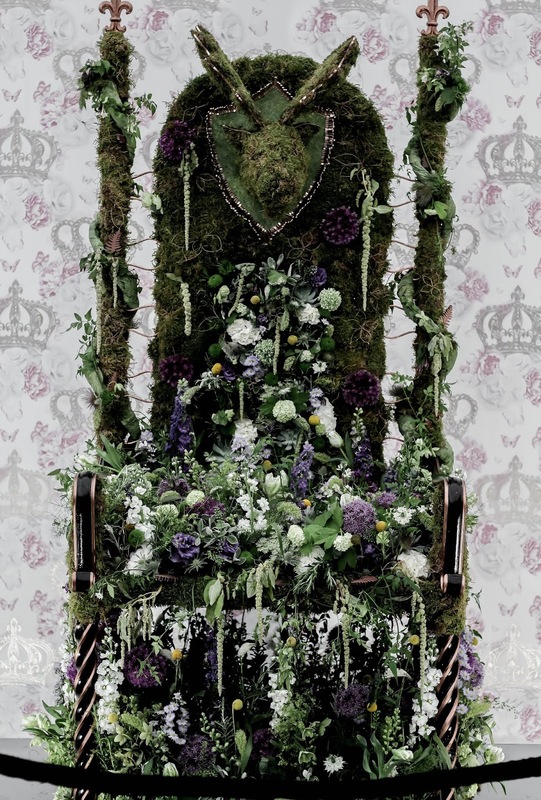 Those wedding thrones are stunning, especially that of the second pic!! It must be a truly unique show and I would like to be there the next year to be able to participate! Hi Roberta! Thanks for your lovely comment :) Pimms is a typical British fruit/alcoholic drink! I'd absolutely love to go to Chelsea someday, it looks gorgeous! The M&S market is beautiful - but then so are all the others! I love so much this idea, I've never saw something like that before, all these incredible flowers... wow! Looks so spectacular! 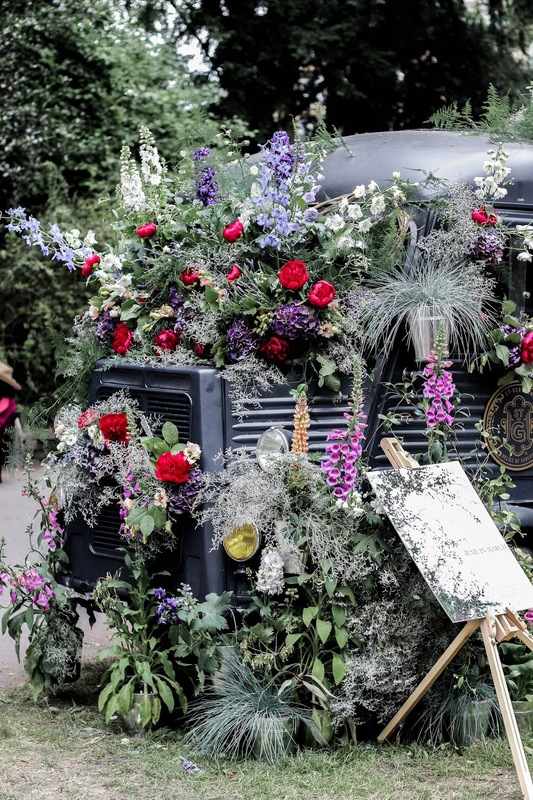 I've never seen Chelsea Flower Show, but it goes to my bucket list! 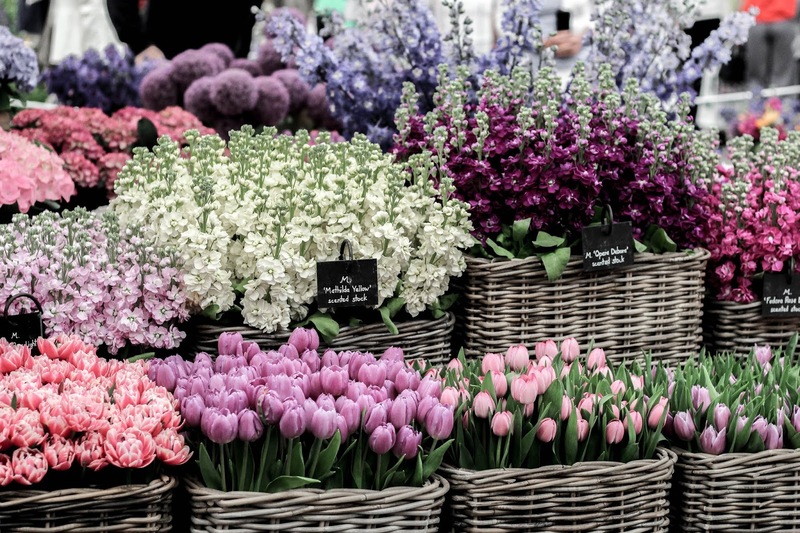 I would just get lost in between all of these gorgeous blooms! The return of spring colors. Your dress goes so well with the theme!!! :D Looking great as always Gabrielle!